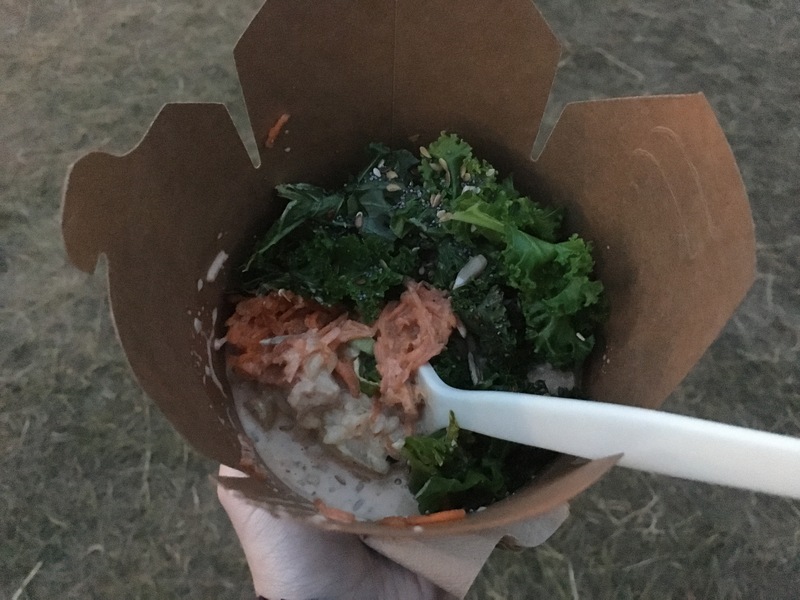 Having just about recovered with some nice long nights’ sleep, and to try and shake off the post-festival blues, I wanted to share with you why I think Wilderness should be the festival of choice for vegan foodies. 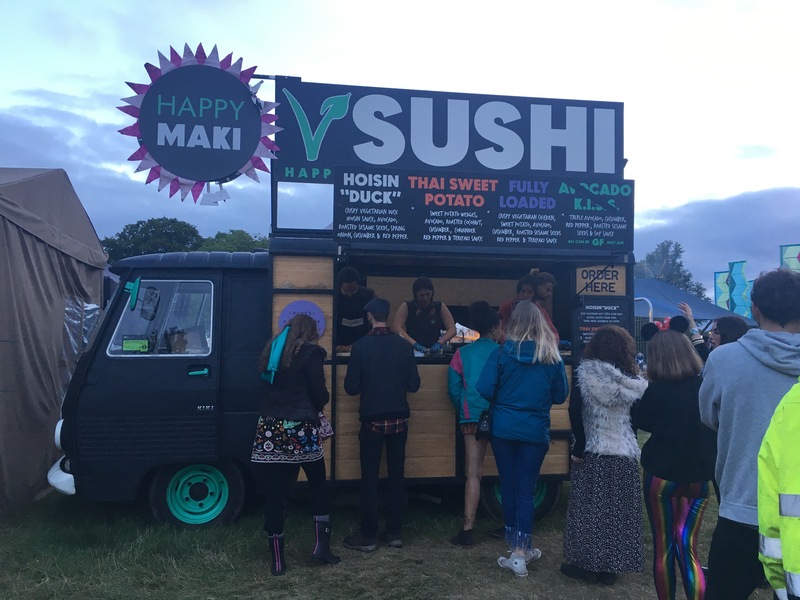 Cast away your usual expectations of overpriced greasy festival food, because the vegan street food on offer at the site in Cornbury Park, Oxfordshire, was the best of the lot as far as I could tell! Despite having taken a camping stove, and I will admit to having a couple of packets of cheap noodles for lunch, there was so much amazing vegan food on offer that we ended up bringing most of our tins back home with us unopened. 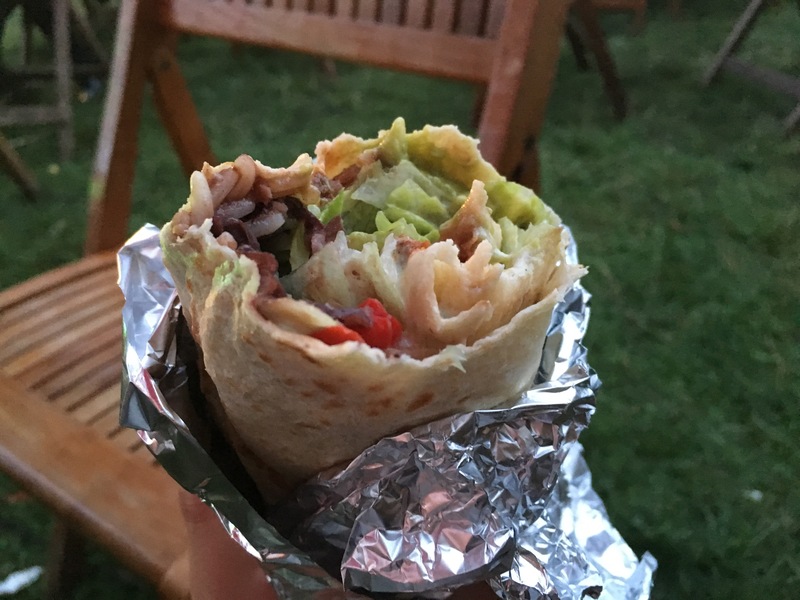 Many of the food trucks and vendors I visited can be found at other events in Oxfordshire, London, and further afield, so I’d recommend keeping your eyes peeled for an appearance near you. Mexican food has become a staple at home for me and Jamie and Club Mexicana looked right up my street, so was the first vendor I decided to try. It was a tough decision between a burrito or tacos, but in the end the burrito won, and I didn’t regret my choice. A tortilla was packed with BBQ pulled jackfruit, guacamole, black beans, salsa, and a couple of sauces. 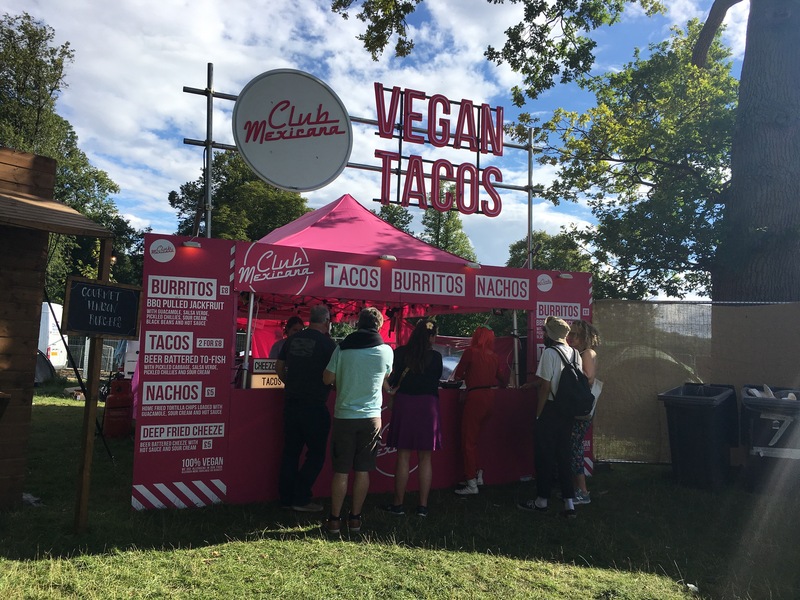 It was ‘meaty’ and filling and pretty much a festival-goers dream. I was so tempted to go back for a side of deep fried cheeze which sounded intriguing, but was too full from the burrito. I’ll have to cross my fingers that they’re serving it up at Kerb in Camden next time I’m there. 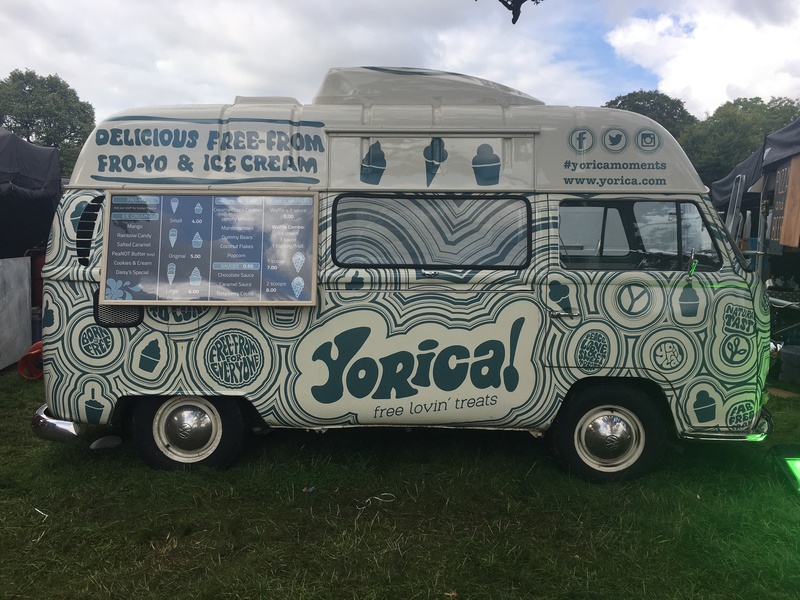 Yorica’s permanent residence is in Soho, London, but they have an ice cream truck which I regularly seek out at vegan and free-from events. 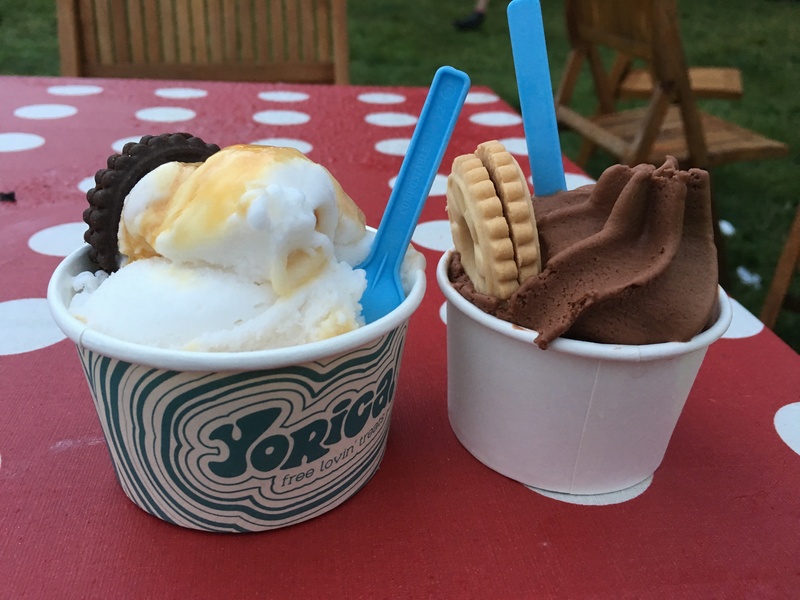 Many of their ice creams and fro-yo flavours are free from all of the major allergens, with all of them being suitable for vegans to enjoy, including their large variety of toppings. My favourite is the smooth and creamy chocolate fro-yo, which I can’t resist topping with a jammy wheel (I will forever be sad at Jammy Dodgers having milk powder added with their latest recipe). My omni Dad got a banoffee flavour ‘ice cream’ topped with a chocolate cookie and he loved his too! I treated myself to a couple of trips to the deli, having visited last year and loved it. I’m a fan of Ella’s energy balls already and was excited at the recent announcement about her new granola and bircher muesli products. As was the case with many of the food vendors here, I could have easily ordered everything off the menu, but in the end I decided on the granola with apple and pear fruit compote and CoYo. It was very pretty, very tasty, and surprisingly filling for the portion size – I took my time over the meal, which is fairly rare for me, and didn’t need to eat again for hours. Later during the weekend I snuck back for a couple more treats: the fudgy chocolate brownie, and a peanut cookie. That brownie tho. How do they get that beautiful chewy texture?! It was so, so good. I just wished for the £3 that it was a bit bigger, though it was definitely filling enough as it was – I’m just greedy. The cookie was really yummy too, similar to a large hobnob, which I’m known to love, with a sweet peanut flavour. I pretended to myself that it was healthier than your average packet of biscuits too thanks to Ella’s love of all things refined sugar free. Deliciously Ella has three permanent Delis in central London, so you can enjoy the vegan goodness all year round. 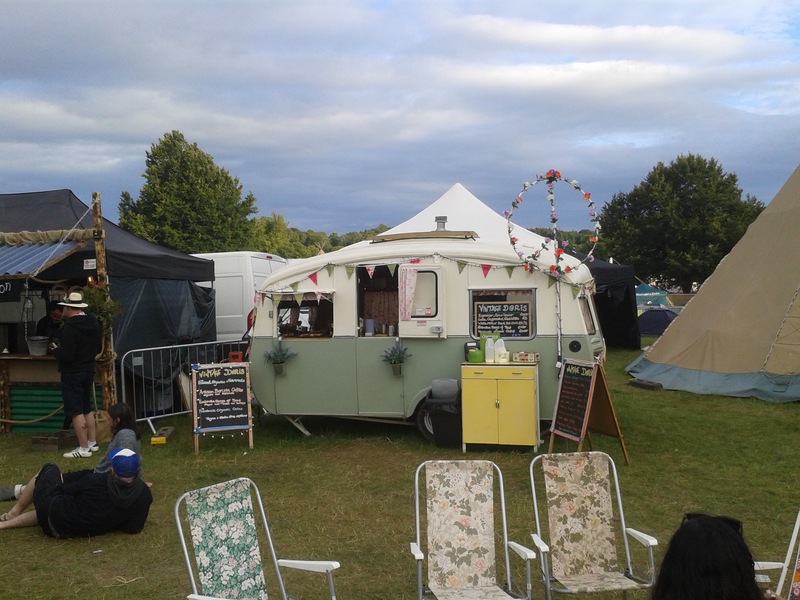 The obligatory afternoon cake on Saturday came from this cute tent. 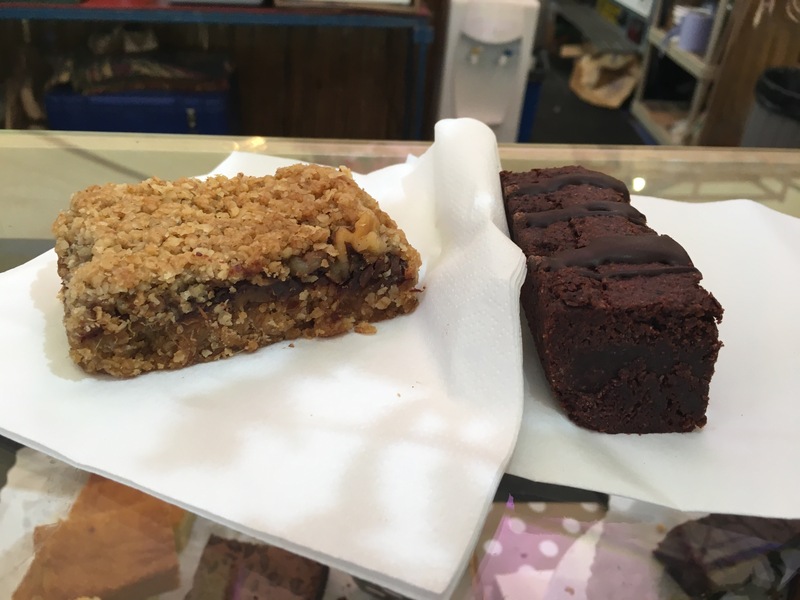 They had a handful of vegan sweet options so we decided to share the date slice, and the hazelnut brownie, both of which were incredibly gooey and rich. The date slice was like the best buttery flapjack (though cruelty-free of course) with added walnut chunks and that melty date centre. The brownie was super chocolatey and decadent. Both were polished off pretty quickly! 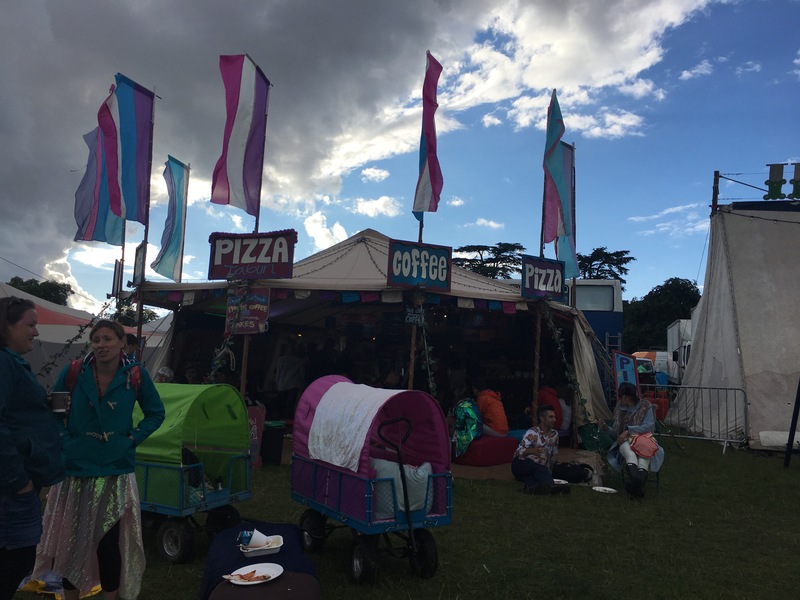 Sadly there just weren’t enough meals in the day for me to try their pizza too, which I’m guessing should be the star of the show, but they had a tasty sounding vegan option with a tahini sauce which I’d have loved to have tried. 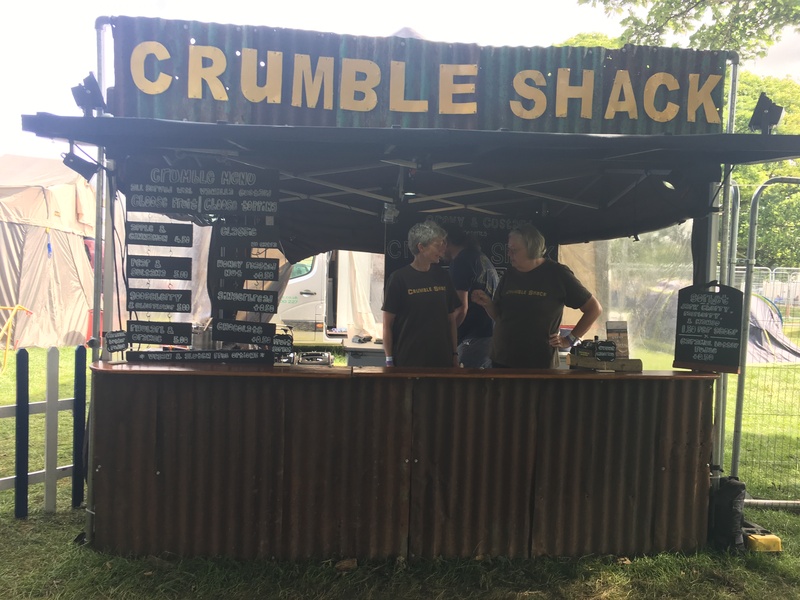 I first tried food from these guys at Wilderness 2016 and made a beeline for them again this year. 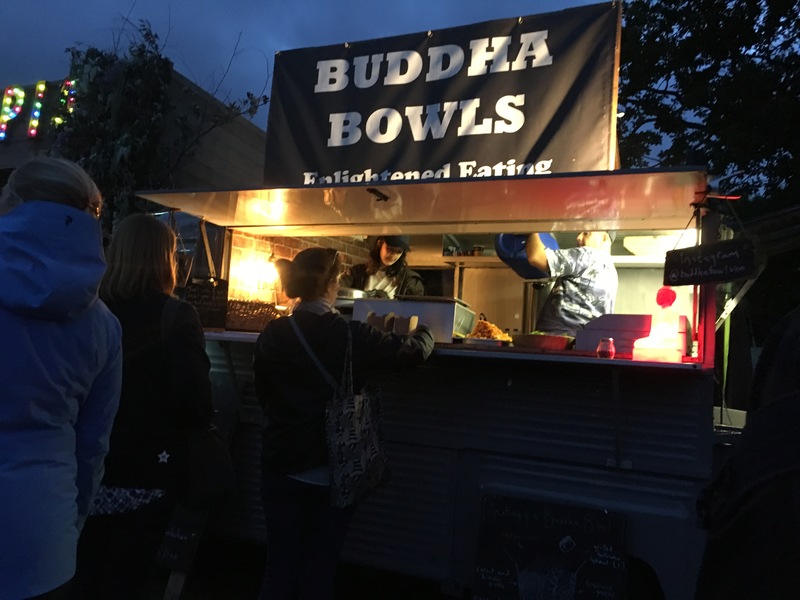 I went for their big Buddha bowl, at only £1 more than the baby bowl, and savoured every mouthful. The mild, creamy massaman curry made with potato, soya chunks, and, interestingly, chunks of pineapple, sits on a generous bed of rice, and is topped with lightly cooked greens, and a mix of toasted seeds for a bit of bite. Standing next to a camp fire and listening to some chilled music from the Folk Barn, I could’ve happily gone on eating this forever. As a child I was an apple crumble fiend, polishing off seconds and thirds even after eating a big Sunday dinner. 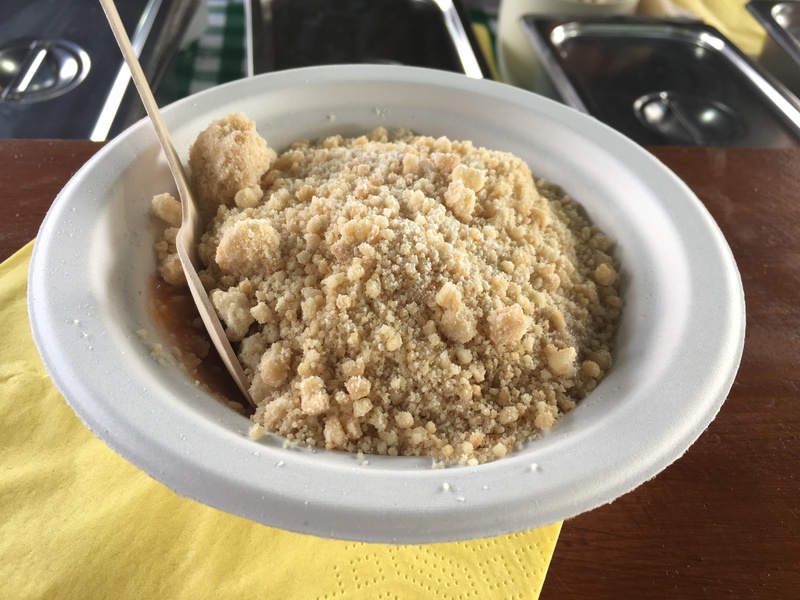 I had tasted the delights of the Crumble Shack at Bitten Street before I was a vegan so was happy to note that all six of the fruit mixtures on offer here were vegan, and there was a special vegan-friendly crumble topping available. The only thing out of bounds was the custard – which is a bit of a shame as I can’t see it being much effort on their part to get a pot of Alpro custard for those who might want it. They were very nice though in letting me choose to try a couple of the different fruit bases rather than just one, and knocked £1 off the price. I opted for the rhubarb and orange, and apple and cinnamon (couldn’t betray my roots), with the sweet and sharp flavours working really well together. Yet another cake (we were there for four days after all). 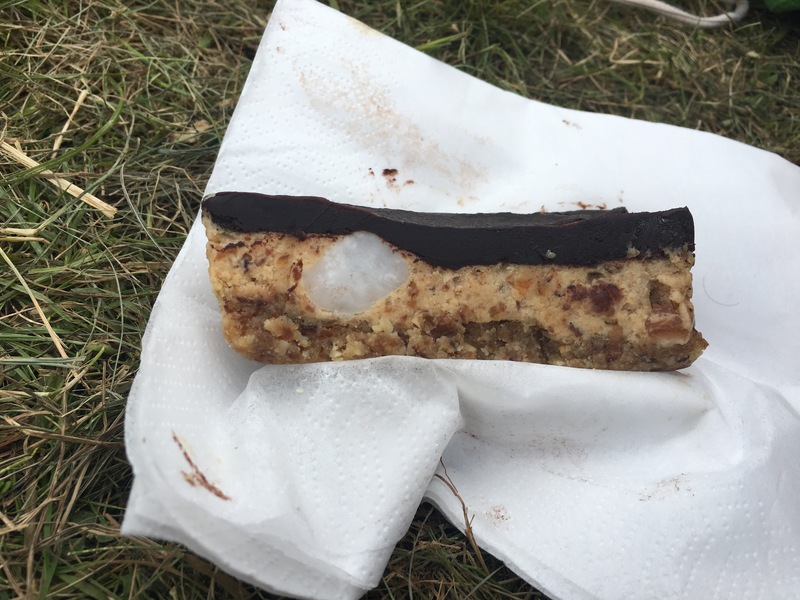 Vintage Doris is an ethical artisan cafe caravan serving up organic and vegan treats, including this yummy raw mocha slice. A bit of a shame about the giant lump of solid coconut oil as seen in the picture but the flavours were spot on, with just the right balance of coffee and chocolate. Often when you buy raw treats they come quite small as they’re usually heavy in calories, but this was a very generous size for the price, and we were able to share one between us. 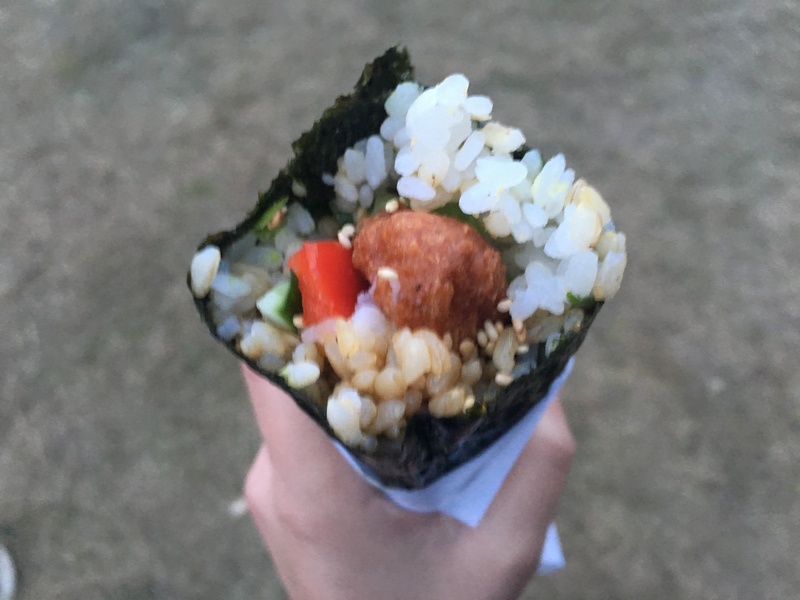 Think of it as a sushi burrito. There was a long queue for this truck, and with it being the last day of the festival the triple avocado option was already sold out. The sushi rollers (is that a thing?) were in great spirits, giving very friendly service considering they were clearly working as hard and fast as they could too. I spent much of my time in the queue deliberating between the flavours as they all sounded fantastic, but in the end went for the ‘fully loaded’, a huge sushi roll stuffed with crispy vegan chicken pieces, sweet potato chunks, veggies, and sushi rice, topped with sesame seeds and optional ginger and wasabi. I have really been on the fence about whether or not I like nori for a long time, but this was such an enjoyable meal, I’m definitely sold on it, and I’m inspired to get myself a sushi mat for home. As if Happy Maki’s food itself wasn’t enticing enough, every meal purchased gave one to a child in need. Alongside all this amazing food was a programme full of yoga, health and fitness, talks, performance (with a sneaky appearance from Benedict Cumberbatch), theatre, and of course the music, which all contributed to a fantastic weekend. Did you attend Wilderness this year? What did you think? Let me know in the comments if you plan on going in 2018 – maybe I’ll see you there; it’s sure to be a fixed event in my calendar from now on.